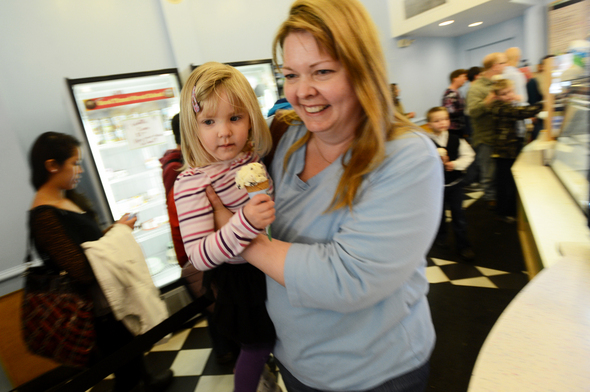 Posted on Tue, Apr 3, 2012 : 4:45 p.m.
Whitmore Lake resident Amy Esper smiles as she carries her 3-year-old daughter Lydia after standing in line to receive a free scoop of ice cream from Ben & Jerry's on South State Street on Tuesday afternoon. Esper, along with her husband and three boys have made a family tradition of standing in the long line every year. The ice cream shop, located at 304 S. State St. near the University of Michigan campus, is giving away one free cone per customer from 12 to 8 p.m.
Ann Arbor residents Midori Watassek, Renee Sink and Beth Spizarny pose for a photograph after standing in line for their fifth scoop of ice cream during Ben & Jerry's "Free Cone Day" on South State Street on Tuesday afternoon. The event is part of an international event organized by the Vermont-based retailer. 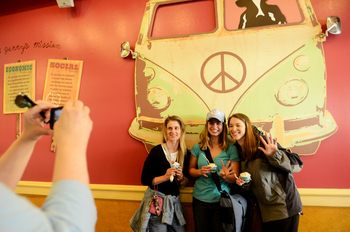 Founded in 1978, there are now more than 350 Ben & Jerry’s locations in the U.S.
By 4 p.m. Tuesday, the line to get inside the Ann Arbor store stretched down South State Street to Nickels Arcade. Franchise owner Matt Arthur said the store served up 4,000 scoops during the event last year. In 2011, seven employees staffed the ice cream counter while multiple volunteers from the University of Michigan Transplant Center also helped. The group benefits from donations during the event. Wed, Apr 4, 2012 : 6:39 a.m. This giveaway does not promote healthy eating....Milk has pus and blood in it...no matter if it is Ben and Jerry's ice cream. A thoughtful mother should be setting an example Mrs. Esper! Go VEG!! Tue, Apr 3, 2012 : 11:49 p.m.
Tue, Apr 3, 2012 : 9:30 p.m. Finally got the notice in time, I'm getting some ice cream!